If the most recognisable feature of the British National Health Service is not having to pay, then how did payment work before 1948? In the three decades following the First World War, patient payments took on a far greater prominence than it had before – both in the form of pseudo-insurance hospital contributory schemes and direct payments effectively means-tested by a medical social worker known then as a ‘Lady Almoner’. This has typically been characterised as a radical change, either effectively privatising or democratising the charitable and public hospitals of the day. My research has found, instead, that there was significantly more continuity than is usually recognised. In fact, payment found a surprisingly traditional accommodation with the established cultures of medical charity and welfare, shaped largely by deeply-entrenched class distinctions. The real change was not to empower patients and potential patients, either individually as consumers or collectively as citizens. Rather, it was to recast their obligation not in socio-behavioural terms but as an economic one to demonstrate willingness to contribute financially as deemed appropriate. They remained essentially passive recipients. Strongly rooted in my doctoral research, I expanded my work in this area after I was awarded my PhD in 2011. 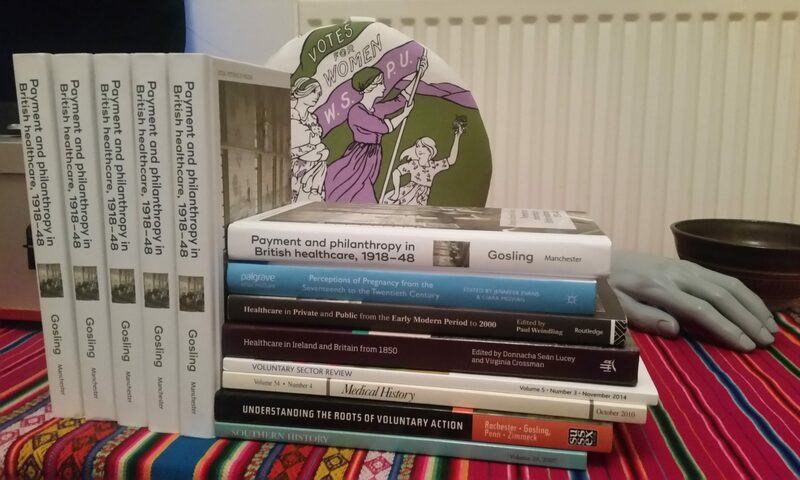 This has led to a co-authored essay comparing patient payments in interwar British and Irish voluntary hospitals, another essay on payment in the pre-NHS maternity hospitals of Bristol, Liverpool and London, and a monograph on Payment and Philanthropy in British Healthcare, 1918-48.